Taking the 'small brown guitar' ethic another step on, Martin reinvents a 157-year- old classic with style and panache. Looks, playability and build quality. Surprisingly versatile tones for a 000 body. Expensive. But otherwise, not a lot! Don't let the modest look fool you, the 000-17SM is a modern Martin that partners mahogany with a sitka spruce top and is nearly as happy in the hands of a strummer as a plucker. Acoustics with predominantly dark tops exude a quite different vibe from the standard 'natural' variety. This writer's first memory of them is via The Beatles and their Tobacco Sunburst Gibson J-160Es; they seemed so much more handsome than the plain folk guitars everyone else was playing. Going further back, images of the early blues masters - think of Robert Johnson with his brunette Gibson L-1 - have come to define that genre's aesthetic to this day. Martin's 17 Series has been around since 1856, enjoying various incarnations in its century- and-a-half history. The series has been discontinued and reintroduced, has come with both rosewood and mahogany bodies, spruce and mahogany tops plus varying levels of ornamentation. 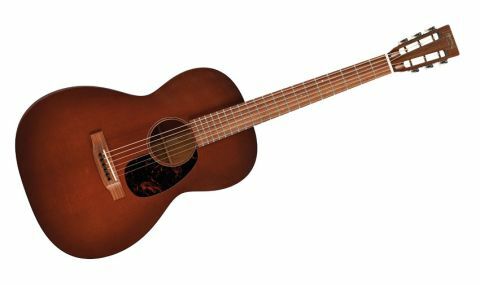 "The main talking point, of course, is that dark-shaded Sitka spruce soundboard; you might assume it was mahogany from a distance"
Essentially, there's no definitive 17 style, so with this new model Martin could choose what it felt best suited today's tastes and market. The main talking point, of course, is that dark-shaded Sitka spruce soundboard; you might assume it was mahogany from a distance. Beyond the top it's certainly not the most ostentatious of acoustics, either. There's no rear body or neck binding, for example, just a single soundhole ring and a line of brown tortoiseshell edging around the top. Even the pickguard blends in, so this guitar whispers its visual presence rather than screams it. "The burst pattern is created by a bespoke, state-of-the-art machine that accepts the full body assembly," he tells us. "Once the shading dries and cures, the body goes into our finishing process, is sprayed with nitro-cellulose lacquer and the top polished to a high gloss." We bet they didn't envisage that back in 1856! We do still wonder, though: would this instrument not look even cooler were it finished in classic Tobacco Sunburst? The guitar comes with Martin's 'modified low oval neck' shape, and it will be interesting to see how this 12-fret 000 with 44.5mm width impresses us with its sound and playability. The action is low and inviting but without rattles. With 0.012s, string tension is stiff enough to avoid flap, but it's loose enough for lead lines. In fact, it's hard to fault on any front, proving once again that Martin's modern guitars are as playable as anyone else's. Traditionally fingerstyle, folk, blues or ragtime guitars, slot-headed 000s are back in vogue after once being deemed old-fashioned, or perhaps just limited compared to a modern acoustic. True, playability is restricted to a single octave of frets, but many acoustic players never get beyond the 7th without the aid of a capo, so why bother with a flat-top that looks like a blown-up Les Paul when what you probably need is something like this? Not surprisingly, the modified low oval neck on this instrument feels different to that of a dreadnought. The wider nut and shorter playing area create a very different feel. Open chords are comfortable to negotiate, while intricate passages are easier because of extra string spacing. The action is perfect, and given the accepted limitations the neck is a dream to play. "Within a minute you begin to appreciate its more characterful speaking voice"
Picking up the 000, within a minute you begin to appreciate its more characterful speaking voice and singularity of purpose. Maybe 'duality' is a better word, because this guitar is a surprisingly good strummer, too. Mahogany's uncanny ability to blend the sonic spectra into one workable tone makes the 000 sound like an instant friend. There also seems to be something very advantageous for tone in the 12th-fret neck join, too. The bridge is in a different place, the body is bigger... Try one! The 17 Series guitars came about due to dealers ordering otherwise all-mahogany 15 series Martins with spruce tops. So successful were the results that Martin ran with the ball and in the process created modern versions of a 157-year-old classic. While simple in design, we can't fault the build, playability or tone of this guitar. The modified low oval neck plays supremely well and the 000 is a picker's delight. That said, this instrument doesn't sit squarely in the ballpark we'd naturally allot it - it strums beautifully, too. There's also something about the mahogany and spruce combination that appeals to us greatly. This guitar is warm-toned, and it's punchy and loud, with no need for breaking in - just perfect for someone wanting the moody look of a 15 but with a touch more sonic sophistication. At £1,499 it's not cheap, but we love this to bits and think you will, too.